The recent firing of over 50 Essentia Health employees that refused a flu vaccine has many talking about whether the flu vaccine should be mandated, its safety, and effectiveness. Overall effective rates around 44%, and strain rates as low as 16%, combined with current scientific literature, are enough for some to question some of the research methods and effectiveness claims of various influenza vaccines. There are lots of conspiracy theories running around the internet, but the most important thing to do is to actually take a look at the scientific literature. More research is needed to determine the overall effectiveness, remove potential biases that skew results, and improve vaccine delivery, which may also make a stronger case for a mandate. 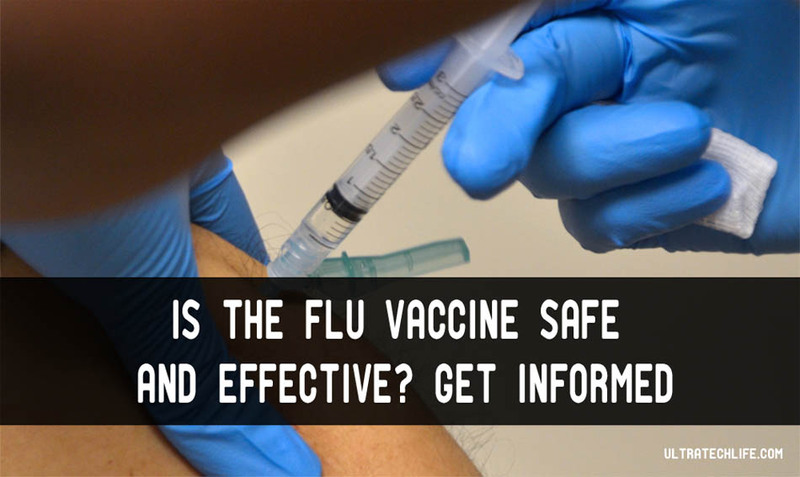 This article will take a look at what science says about the safety and effectiveness of the influenza vaccine as well as some of the current fears about vaccinations and potential links to neurological disorders. Prophylactic vaccination is a great way to reduce sickness and death, associated healthcare costs, and loss of productivity. People need to make informed decisions, based on objective scientific evidence. Flu shots are nothing new, but the discussion regarding their use has morphed since the 1970s. The Centers for Disease Control and Prevention (CDC) once estimated that since 2010, flu hospitalizations were anywhere between 140,000 to 710,000 people. Deaths from the flu in 2010 were also estimated to be between 12,000 to 56,000 people. The range of numbers is because it’s difficult to exactly determine the association between hospitalizations, death, and the flu as the causing agent. Flu shots are difficult because the flu viruses are constantly changing. The vaccine also takes a few weeks to work, allowing your body to develop antibodies that would protect you from the matching strains of the vaccine. The influenza vaccine (flu shot) uses a special inactive, weak-attenuated formula to develop antibodies to the most common flu viruses that season. You do not get the flu from receiving a flu shot itself. It’s possible that certain post-injection immune responses can occur that mimic flu symptoms. You may also get another strain of flu not covered by the vaccine. The CDC says healthy people above 6 months old should get the flu vaccine. Always ask a qualified health professional about whether a flu shot is right for you or not. There are some cases where flu shots are not appropriate. It’s important to make an informed decision before taking any medication. Let’s take a look at what science says about flu vaccines in America. The idea behind flu shots sounds great: reduce hospitalizations, loss of work/productivity, and flu-related deaths. There’s lots of conspiracy theories out there and very few people actually discuss the science behind flu shots, effectiveness, and side effects. We’re going to talk a little bit about that today, in order to educate our visitors and promote sound science. Always focus on the actual science, rather than the loudest voices or marketing campaigns. Our best decisions are based upon objective evidence-based science. Before you go any further reading, it’s important to know a few general concepts about science. There are many claims on the internet, social media posts, and even from the news media, doctors, and science journals. Despite the label of being “official” or “scientific”, much of the content floating around is neither. In fact, junk science is rampant. Some people believe popularity determines whether something is science (fact) or fiction (false). If something is said enough, people generally begin to believe it, especially if you don’t understand science and the scientific method. Bias is something that can quickly create junk science. Some manufacturers will use this to their advantage. Purposely using bias to throw out objectivity, just to get the results you want, which favor your desired results or support your specific position, is just one of many tactics used by those who engage in pseudoscience< (junk science) practices. Unfortunately, junk science can and often does find its way into science journals, in the media, and it can even spread through a large portion of doctor’s offices. What’s especially problematic is when such large marketing campaigns pass something off as so above questioning, 100% effective, or demonizing those that question the efficacy or side effects, do so based on junk science. We know that infographics and popular social media posts can directly influence the public perception of a drug and its effectiveness and safety. Qureshi et al. (2004), in the Journal of Occupational Medicine, provide an example of the effectiveness of influenza info graphics campaigns for health workers. Are we picking and choosing only the supporting evidence for flu vaccination? Belongia et al. (2011), Journal Vaccine, estimated: 44% effectiveness. Zimmerman et al. (2016), Journal Clinical Infectious Diseases, estimated: 19% effectiveness. Barbera et al. (2014), Journal PLOS One, estimated: 33% effectiveness. Jackson et al. (2017), New England Journal of Medicine, estimated: 48% effectiveness. Ohmit et al. (2014), Journal of Clinical Infectious Diseases, estimated: 47% effectiveness (even lower effectiveness rates against certain circulations). Sullivan et al. (2012), Journal of Medical Virology, estimated: 45% effectiveness. Pavia (2016), Journal of Infectious Diseases, estimates: quadrivalent LAIV effectiveness of just 17% for children during the 2013-2014 flu season. The above science journal resources seem to indicate the influenza vaccine is on the failing side of effectiveness, most of the time not effective. About 55-83% of the time, flu shots fail, if you consider overall rates as well as the lower specific age-immunization type rates. The above numbers are just a few examples of effectiveness. One can skew the numbers in other directions, if you remove the overall picture, and try to pick and choose specific favorable age groups and various confounding variables that are not well understood or measured (still some people use them to get better effective numbers). In general, science says the influenza vaccines are ineffective a majority of the time for all age groups. The first part sounds great, but then you get to the rest of it, where it says these vaccines are only effective against similar circulating viruses. There’s your first sign that the vaccines are hit and miss. Further, there’s a direct statement about overall economic benefit being questionable. Certain vaccines are more effective than others, but the influenza vaccines have many issues that need to be discussed. Some of the biggest arguments for flu vaccines involve the at-risk elderly populations. Anikeeva et al. (2008), appearing in the American Journal of Public Health, argue that annual influenza vaccination for health workers has a good cost-benefit ratio. Their study also showed that most health workers refuse the vaccination. They also go on to say that incentive and punishments should be used to get more workers accepting the vaccine, short of saying someone should be fired. How convenient of them to leave out any of the legitimate reasons why so many health workers (physicians, nurses, emergency medical technicians, etc.) don’t see the vaccine in a positive light. These people are on the front lines of medicine, they know disease and injury better than anyone else. Why would so many people have issues with the influenza vaccine? Greene et al. (2010), appearing in the American Journal of Epidemiology, argues: “with administration of 1,195,552 doses to children under age 18 years and 4,773,956 doses to adults, no elevated risk of adverse events was identified.” Millions of doses, if unsafe, would have higher adverse reaction reports. The low number of serious adverse events seem to indicate some level of safety – but this should be thought of in context (we will discuss methodologies and under-reporting of adverse reactions later). How did the researchers determine which people with adverse reactions to include and which to exclude — and is this criteria subjective or based on objective scientific reasoning? The “risk periods” in many study control groups appears to be somewhat subjective and highly manipulated, which could skew drug safety findings. How many people know what to do if they experience side effects from a medicine and where to report it to? How many people actually report side effects? Very few people are actually reporting side effects and there is no consistent network or up-front direction to do so from most doctors. Many studies will exclude people from their statistics for not meeting various documentation requirements — does that mean these excluded people led to a reduction in adverse reactions to flu shots? These are legitimate questions to ask. We will also cover why so many people do not trust many pharmaceutical-financed research claims. This presents problems: underestimated side effects/adverse reactions to medications and overestimated safety claims of drugs. This isn’t just a problem for the flu vaccine, it’s a problem for all medications. What are the long-term effects and how can an adverse effect be tied to the vaccine – years later, particularly in developing children? This is why many are rightfully concerned. America has many complicated health problems, which makes it difficult to separate cause and effect. It’s unfortunate that science is full of potential conflicts of interests that might not be acting in the best interest of science itself or the patients that will be impacted. Always check the financial disclosures and ties any author has to potential conflicts of interest. One should keep this in mind, when considering a source, and also consider that just because someone is paid by a large pharmaceutical company doesn’t always mean their research is wrong or misleading. However, there have been proven cases where/when money has been paid, as described in this article, to purposely skew medical research and safety data, enough that people need to be aware of the possibility. Previous fraud and junk science cases have also contributed to public towards science and ultimately feeds wild conspiracy theories. We have to get back to focusing on objective science. Have you heard about Guillain-Barré syndrome (GBS)? This is a disorder where the immune system attacks the peripheral nervous system. It’s a terrible disease that can result in total paralyzation. It could also progress to interfering with blood pressure and heart rate, which could then result in death. The possibility of getting GBS is increased after using various influenza vaccines. The question is: what’s the risk of getting this from a flu shot? Keep in mind the flu shot effectiveness numbers from above and ask yourself if it’s worth the risk. Science certainly says that the risk is lower than many conspiracy theorists say, but cases have happened, according to Greene et al. (2012) and this piece from Vellozi et al. (2009). Some of the fear stems from the 1970s cases of people getting GBS after vaccination for swine flu. The chances of getting GBS from a flu shot are very low, but there is a risk of this after getting some versions of the influenza vaccine. Other more common adverse events have been reported. Tse et al. (2012), in the journal Vaccine, report that there were cases of febrile seizures, particularly among young children. This scares parents. Ages 6 through 59 months were surveyed in this study. You can also note that long-term details are lacking. The numbers of seizure events were very low per 100,000 doses, which should be put in context of the rest of matters discussed in this article. It’s important to note the definition of adverse events, who’s included/excluded, and whether this was done for other populations. Not everyone uses the same vaccines and it’s incredibly complicated to measure safety, especially without universal participation and standards. Here we will show you some examples of direct conflict of findings. Some of these are very serious and may be the primary reason why so many health professionals and parents are refusing the influenza vaccine. These issues need to be addressed. For example, Mitkus et al. (2013), appearing in the journal Risk Analysis, report that small amounts of mercury used as preservatives for inactivated influenza vaccines for U.S. infacts were generally safe. If conspiracy theorists are not happy with this statement, they have to realize that scientists have infants, children, and worry about the same issues. If there were problems, they will be discussed, and because of the large amount of scientists in the world, someone is going to say something. There’s nothing wrong with being concerned or informed, but you have to consider the science and not just rely on concpiracy theories. In another example, Gadad et al. (2015), appearing in the Proceedings of the National Academy of Sciences of the United States of America (PNAS), gives an example of injecting primates with thimerosal-containing vaccines to determine autism-like behavior or neuropathology. They found no such link and extend this finding to human infants. Do we just blame conspiracy theorists or did the vaccine scare come from another source, at least initially? If you dig deep enough, you can find pretty scary stuff about mercury. The use of mercury-based content in a vaccine has to be examined in context. It’s always best to be on the side of caution. Solving the conflicts is a matter of turning back to objective science, removing biases, conflicts of interest, and more comprehensive monitoring (data). Rather than become defensive or ignore questions, healthcare providers and scientists alike need to have an open discussion, which covers the current science of vaccines, safety, talk of conflicts, side effects, and just be honest about these matters. We could do a better job explaining things, presenting health science in K-12 education (as early as possible), monitoring our public, helping people report problems, and having two-way discussions about these kinds of topics. Science is awesome because we can improve existing problems. In this case, we could try new ways to monitor vaccine side effects. We could eliminate any barriers that make it hard for patients to regularly report problems. One example of this is Adeyi et al. (2012) in the journal Vaccine, which attempted to create a system of active surveillance for vaccine adverse events. In their study, about 15% of the people had severe reactions, and about 85% had mild post-vaccine symptoms. About 4% reported weakness, 1% reported a rapid heart rate, and 3% reported dizziness. Obviously, temporary and mild reactions to a vaccine that could prevent loss of life, productivity, and reduce economic burden is totally worth it, in general. Only 545 people were included in this study. It would be very interesting to see what a larger group would show. The 15% figure is slightly concerning, especially upon the premise of 16-44% vaccine effectiveness. The above figure seems consistent with other research, such as Mayet et al. (2011), appearing in the journal Vaccine, reporting about a 97.1% rate of “non-serious” post-vaccine adverse events. The serious side effects all resulted in hospitalization and other problems, such as GBS. Again, is one year enough of a post-vaccine survey of side effects enough to say it’s safe? The difficulty here is as time goes on, it’s very hard, in many cases, to match an outcome as a direct result of a vaccine. This is also why we must use the best science, be objective, and focus on safety, rather than profit. According to the CDC, the most common side effects of the flu shot include: soreness, redness, swelling at the injection site, cough, fever, aches, headache, itching, and fatigue. This is due to your body responding to the medication. Other more serious side effects were rare: seizure and GBS. If you are at-risk or immune compromised, the flu could be deadly for you. The question then becomes: is this vaccine, and associated risks, worth trying, especially if it prevents me from dying or being hospitalized from the most common flu strains that year? If you spend months reading the majority of science journal articles about various flu vaccines, an overwhelming amount indicate a questionable effectiveness rate. The overwhelming amount of similar data suggests that serious adverse reactions to flu vaccines are generally low, but worth further study. Questionable methodologies, overestimations of effectiveness and safety, underestimations of adverse events, and conflicts of interest could present significant bias to cause problems with findings. Given the literature out there that describes safety, the flu vaccine is generally safe — in specific contexts where the benefits outweigh the consequences. The vaccine might not be appropriate for everyone, at least according to the above literature. Individuals must weigh the risks and benefits in their own personal situation. Why do so many conspiracy theories exist about the flu shot? Many people lack a basic health science background, which could help them make informed decisions as to what is true or not. There’s other reasons that place the blame on the medical industry itself. Many people don’t trust the pharmaceutical industry and they have good reason not to trust them. ULTRA TechLife previously presented federal documents and links to science journals describing such issues. This is unfortunate because evidence-based (scientific) medicine is excellent, generally safe, and ethical. Such distrust is the result of decades of perpetuating junk science, publishing misleading information, engaging in fraud, paying off doctors, and more. The US government once published details of one of the largest cases of pharmaceutical fraud in US history back in 2012. Many details were never released to the public and these companies are still in business today. Medicine is big business and one could certainly see where problems can occur, especially if profit is more important than sound science and patient care. Big pharma companies have been caught fraudulently pushing medications on unsuspecting patients with the help of willing physicians. In fact, the Department of Justice has also listed one of the largest cases of pharmaceutical fraud by GlaxoSmithKline in 2012. The pharma company purposely misled people about psychiatric medications and their safety. It’s very frustrating to have so many doctors tangled up in fraudulent medication studies, such as those published by GlaxoSmithKline. It’s just as frustrating to have so many doctors accepting cash and gifts from companies in exchange for pushing potentially dangerous meds on their unsuspecting patients. Patients find themselves in a difficult position because they are supposed to trust doctors. Other scientists also find themselves in a difficult position because they point out that sometimes even the most prestigious science journals have misleading and fraudulent data in them. How can you disagree with a doctor? How can you disagree with studies (so many biased by pharma cash)? Paxil: In the criminal information, the government alleges that, from April 1998 to August 2003, GSK unlawfully promoted Paxil for treating depression in patients under age 18, even though the FDA has never approved it for pediatric use. The United States alleges that, among other things, GSK participated in preparing, publishing and distributing a misleading medical journal article that misreported that a clinical trial of Paxil demonstrated efficacy in the treatment of depression in patients under age 18, when the study failed to demonstrate efficacy. At the same time, the United States alleges, GSK did not make available data from two other studies in which Paxil also failed to demonstrate efficacy in treating depression in patients under 18. The United States further alleges that GSK sponsored dinner programs, lunch programs, spa programs and similar activities to promote the use of Paxil in children and adolescents. GSK paid a speaker to talk to an audience of doctors and paid for the meal or spa treatment for the doctors who attended. Since 2004, Paxil, like other antidepressants, included on its label a “black box warning” stating that antidepressants may increase the risk of suicidal thinking and behavior in short-term studies in patients under age 18. GSK agreed to plead guilty to misbranding Paxil in that its labeling was false and misleading regarding the use of Paxil for patients under 18. Wellbutrin: The United States also alleges that, from January 1999 to December 2003, GSK promoted Wellbutrin, approved at that time only for Major Depressive Disorder, for weight loss, the treatment of sexual dysfunction, substance addictions and Attention Deficit Hyperactivity Disorder, among other off-label uses. The United States contends that GSK paid millions of dollars to doctors to speak at and attend meetings, sometimes at lavish resorts, at which the off-label uses of Wellbutrin were routinely promoted and also used sales representatives, sham advisory boards, and supposedly independent Continuing Medical Education (CME) programs to promote Wllbutrin for these unapproved uses. GSK has agreed to plead guilty to misbranding Wellbutrin in that its labeling did not bear adequate directions for these off-label uses. For the Paxil and Wellbutrin misbranding offenses, GSK has agreed to pay a criminal fine and forfeiture of $757,387,200. Avandia: The United States alleges that, between 2001 and 2007, GSK failed to include certain safety data about Avandia, a diabetes drug, in reports to the FDA that are meant to allow the FDA to determine if a drug continues to be safe for its approved indications and to spot drug safety trends. The missing information included data regarding certain post-marketing studies, as well as data regarding two studies undertaken in response to European regulators’ concerns about the cardiovascular safety of Avandia. Since 2007, the FDA has added two black box warnings to the Avandia label to alert physicians about the potential increased risk of (1) congestive heart failure, and (2) myocardial infarction (heart attack). GSK has agreed to plead guilty to failing to report data to the FDA and has agreed to pay a criminal fine in the amount of $242,612,800 for its unlawful conduct concerning Avandia. According to the National Research Council, lawsuits against US drug companies are rare. This is because current US policy allows for an amount of people to experience terrible side effects without liability to the company because side effects are inherit to any medication. Although this is somewhat necessary for medications to exist, there must be a way for people with legitimate claims to pursue companies that use junk science, mislead people, engage in fraudulent research, and so forth. These people have legitimate claims and no law should protect corporate environments that engage in these practices that ultimately result in patients living with lifetime damage caused by their products, or worse, death. According to objective science, nothing should be above questioning or the demand for evidence to support something. Either something is scientific or it isn’t. We must be careful with our litigation system, in a way that permits legitimate suits, but protects research and development from frivolous or inherit, unintended consequences. For or Against Flu Vaccines? Marketing efforts exclusively focus on the positive aspects of flu vaccination, such as cost-to-benefit ratio. Flu shots are cheap, compared to sickness that requires hospitalization time and associated costs. Flu shots were once targeted towards older adults, particularly in elderly care environments. The 100-300 annual infant deaths from flu-related conditions could be reduced, according to some of the above sources. Here’s just one example why we shouldn’t be mandating flu vaccines as of yet. Until science is very concrete and effectiveness is consistent, we should continue to study the matter. What if you found out that a vaccine program’s effectiveness could be negated by something as simple as people taking common over-the-counter pain relievers? It turns out that some research suggests popular pain relievers, which most people take, may interfere with the effects of the flu vaccine. Given that information, if you had a population that was forced to get the flu vaccine while simultaneously taking common over-the-counter pain relievers, the effectiveness becomes even more questionable. The science behind flu vaccine research says current vaccines have a low effectiveness rate, failing a majority of the time (about 16-47% effective rates, according to the science literature cited above). Flu vaccines are cheap, from the perspective of paying for a shot versus extended hospitalization for severe flu cases. The flu vaccine might not be appropriate or beneficial for everyone. The cost-to-benefit for elderly populations is likely overestimated. The low effectiveness rate and some potentially serious adverse vaccine effects cause health care professionals to question whether mandatory flu shots should be a corporate policy. Some adverse influenza vaccine reactions are likely underestimated. Much more unbiased, long-term, and real-time study is required, especially if mandatory flu vaccination policies are to invoke the good name of science. Evidence-based medicine should use objective science, nothing else. Medicine is a great thing, if it’s used appropriately. Given the above discussion, flu vaccines seem to be generally safe and somewhat important for at-risk populations. It’s difficult to define at-risk, which could widely vary on a case by case basis, specifically for people with certain existing health problems. More research is needed before this becomes a universal mandate for any population. If the unbiased, objective evidence-based effectiveness of these vaccines could be improved, and safety levels maintained, we could be getting closer to a strong argument for mandatory influenza vaccinations. The most important thing for you to do, and the best decision you could make, is to first become informed about the flu vaccine, and then make an objective, evidence-based decision based on the science that’s out there — not a politician, talk show host, celebrity, or other random opinion. Read the science. Go read the sources yourself, ask your doctor questions. If you feel your doctor isn’t being honest, find a second qualified opinion. All drugs have side effects, some are more serious than others. Drug companies *sometimes* do engage in fraud and misleading information, but you’re going to have to find your way through all of the biased information. Unfortunately, this is difficult, especially for people without statistics, medical, or epidemiological knowledge. You must decide whether the benefits outweigh the risks. You’re always welcome to ask a qualified medical professional, and they certainly should be willing to answer your questions. According to the science above, there is evidence to support a reasonable policy for a healthcare professional to receive an annual influenza vaccine because: (1) it may reduce loss of work time/productivity among essential health providers, (2) health workers come into contact with the elderly and immunocompromised individuals where it makes more sense to vaccinate younger healthcare workers with better immune system responses, (3) the low effectiveness rate combined with generally acceptable side effects and risk is worth the cost-effective attempt to reduce flu-related deaths and hospitalizations, and (4) vaccine policies are effective in raising vaccination rates. At the moment, there is ample scientific literature that at least questions the validity of various influenza vaccine studies, methodologies, safety, and overall effectiveness. Given these factors, once again, it’s critical that we further research flu vaccines, focusing on effectiveness, comprehensive monitoring, and safety, which would help make a stronger case for mandatory vaccination policies. In the case of health workers, the current approach is to consider potential liability and risk reduction — because of the high risk environment. Therefore, there is an argument for vaccinating health workers and other people that come into contact with at-risk populations. Hopefully, future high-quality research will present more unbiased, stronger, and consistent evidence of increased effectiveness and safety of flu vaccination practices. There is definitely a lot of money involved in this matter and the corporate medical world will favor even fractional risk reduction, even if 16-45% effective, particularly if the benefits outweigh the consequences. More unbiased, consistent, transparent, and real-time research is needed to (1) increase the effectiveness of flu vaccines, (2) collect more comprehensive and representative reports of and monitor for adverse events, (3) develop a universal policy for which populations should be targeted for flu vaccination, (4) more objective science-based reporting to the public, and (5) in-depth review and communication as to why so many healthcare professionals currently refuse the flu vaccine claims and work policies. These issues should be address before we approach the idea of mandating the influenza vaccine. On a side note: if strong scientific evidence in favor of a mandatory flu vaccine exists, it would be unscientific, illogical, unreasonable, and otherwise foolish to leave a “loophole” for religious and superstitious objections to something that has been proven by modern science and is ultimately a utility for reducing sickness and saving lives. The ability to object to health and safety, based only on a superstitious belief, should not be a valid reason to refuse modern medicine. Be careful about websites, videos, forums, or blogs that offer uneducated, unsourced opinions. Our article is well-cited and is authored by a health science professional. Look for scientific sources, measurements, and data for every claim. Your health is an important matter that goes beyond pharmaceutical use. You should be making informed decisions, based upon objective evidence-based science. Flu shots are generally safe, but may have side effects, most of which are minor. A flu shot doesn’t give you the flu, but it may give you minor aches, pains, runny nose, and weakness. Flu shot effectiveness is somewhat low, but may be beneficial to at-risk populations and in the context of risk management, particularly for healthcare workers. This is an issue that needs much more attention and open discussion. Stronger science behind flu shots and effective public communication could result in higher vaccination trends. We encourage you to read all of the above sources cited. Many require medical knowledge, and in that case, ask a qualified professional. Science journals also require an advanced understanding of statistics, further complicating whether something is true or not — it’s not that simple. By using our website, you agree to our Terms of Service. We promote sound science, expert opinions, backed-up by scientific sources. It takes hours, months, and years to research the articles we produce. We also have many experts that contribute free content to our news network. We present unique science and tech from expert perspectives. Please help us by linking to our page, sharing it with friends, and liking our social media accounts (Facebook and Twitter) — coming soon in 2018!